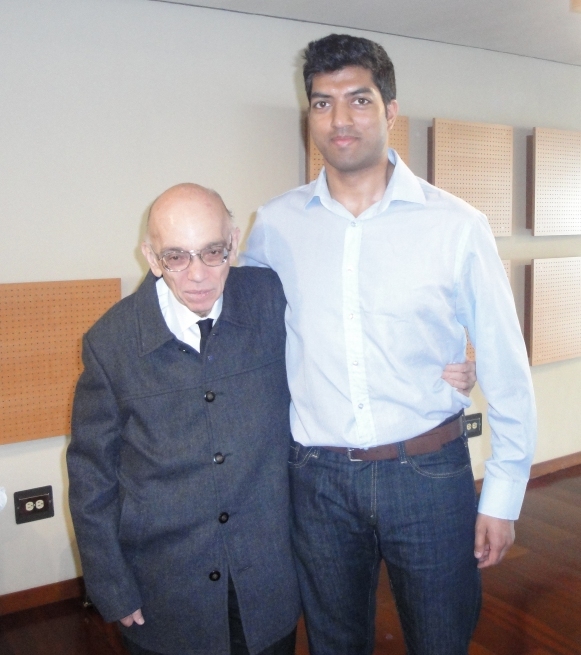 I met Dr. José Antonio Abreu today. I can’t and won’t reproduce in any detail the discourse that took place, but the impression he left was profound, and I would say that even if I were not aware of his tremendous leadership of the movement and his manifest accomplishments. He’s not particularly animated, employing very restrained body language and vocal tone, nor is he prepossessing physically, being of small stature and conservative dress. But when he spoke, he made evident an incredible, unrivalled depth and breadth of thought. He left no doubt that everything el Sistema does is carefully considered: the social, sociological, pedagogical, psychological and economic consequences or implications are all weighed and contemplated. The crucial point is that despite the power of his intellect, he never was or will be paralyzed by it: he is an extraordinary example of the perfect equilibrium between thought and action. He didn’t wait until every piece was perfectly in place, or every condition was met, he acted, but taking the most informed course of action at the time. You’d think this method, seemingly rudderless, would lead to complete and total disorder, but that simply hasn’t happened. Abreu himself described the approach as rooted in chaos theory,although the phrase doesn’t mean what the words might literally suggest: it’s the mathematical concept that a constrained set of variables or values can produce significantly different, or even surprising manifestations, all of which are intrinsically linked to the starting data set. A nice analogy is an apple seed: you know for a fact that in planting it, an apple tree will grow. How tall, how many apples, how many branches: all these and more can and will change for every single tree – but you can be certain that the tree will be an apple tree. For el Sistema, the variables or values, the seeds, aren’t numeric or algebraic: they’re pedagogical and social. Each flowering (another Abreu word) is unique, most suited to the local growing conditions, but is also firmly rooted, or deterministically constrained, by the fundamental principles of music as an agent for social change. Most importantly, the loop is not closed or finite, but constantly evolving as the context changes. The musical network here is in a state of “being on the way to being”, as Abreu put it, a work in progress never to be completed. Intentionally. This is a most ingenious paradox, and those following the movement beyond Venezuela should take heart. Know what seed you’re planting – but then plant it. The best day to start was yesterday. Maestro Jonathon, I am already enjoying your post from Venezuela too much. Seeing you tower over Maestro Abreu standing under your arm with his arm wrapped around you makes me wonder if you have Sikh Uncles. He clearly seems touched by your sincerity. Also being tall, it again takes me back to my experience with Suzuki Sensei. As these intuitive men grow with age and experience they develop the most amazing skill at reading our physical gestures for our potential and intentions, from a great distance away. You have been carefully surveyed. Don’t be surprised how fast this man moves when he has made up his mind about something. Another interesting discussion about the nature of wisdom and physics. Every strait line is in search of a curve. I loved your analogy of the apple. The only way to get a consistent variety of apple is to graft/clone it. This means that an industrial orchard requires a great deal of maintenance for the life of the trees. If one plants seeds as Johnny Appleseed did, you end up with every variety of apple from sweet to sour, from large to small regardless of the specific genera of apples you carefully take the seeds from. Most of the apples that Johnny planted became the tart varieties which make much better ale and cider than sweet eating apples. A very useful thing if safe drinking water is unreliable. During periods of temperance gardeners were faced with protecting such sour tasting apple trees with their lives. Currently there are two botanist who have revived an interest in saving as many varieties as possible. It shouldn’t be too hard. Understandably, you are all required to scatter like the seeds. Appreciate each other’s company while you have it. We have no way of knowing which seeds will be planted where they can flourish. Be true to your own natures but be tolerant of the variety in each other’s expression. You will need to learn from one an-other’s experience even if and especially if it is different from your own. Unlike trees you each have legs. If you find yourselves planted in the wrong soil or the wrong climate you can move your tree to a place where your skills match up with the abilities needed. If you enjoy starting projects you may discover that there is a future Abreu Fellow that fits a location that one of you has prepared better than you do. Be adaptive, but self-knowing. Is that not the genetic inheritance of a social creature? Being in the process, on the “way”. . . . Such an Asian notion for a Latin American to have. An idea that once again takes me back to Suzuki Sensei. We will all have to consider leaving something for the next generation to do.